My journey with Website Building started in 2010 when I lost my job. I was looking for a way to make a living where I wasn’t beholding to an employer. A way that I could make a living on my own terms. When you are tied down to the whims of your employer, your life and livelihood can get ripped out from under you at a moments notice. It is devastating to have employment one minute and none the next. I did find another job but I kept up my Wealthy Affiliate education in the background. One thing is sure, life changes are inevitable. In today’s economy, it pays to have a backup plan. Something that will sustain you when life throws you a curveball. I found that Wealthy Affiliate provides that security for me. The training at Wealthy Affiliate has given me the tools and education to make it on my own. Now I am able to generate enough income on my own without needing an employer. I have seen many changes happen inside Wealthy Affiliate and on the Internet itself over the last 7 years that I have been a member of Wealthy Affiliate. Wealthy Affiliate is constantly updating the services they provide. This keeps the training current and cutting edge. You won’t be wasting time with outdated techniques or bad practices that will get you nowhere. There are more success stories. You can benefit from their stories and find out what is working for others so that you can model your activities around what works. The community is active a helpful at all times of the day. With members in every country in the world, WA never sleeps. You can always find someone that is willing to help you in a timely manner. Weekly Live Training Seminars cover an amazing variety of topics that help you to succeed. Wealthy Affiliate is primarily an Affiliate Marketing Training program. The goal of Wealthy Affiliate is to provide the training, in an organized and step by step manner, so that anyone (even a non-techy person) can learn to earn an income using Affiliate Marketing. To top it all off, you are learning new skills. You will be able to create a website for your business and learn what it takes to rank any business. The training will give you marketable skills that you can add to your resume and are what employers need to help them get ahead. Many members go on to start their own businesses helping small businesses in their local area with websites and Search Engine Optimization. 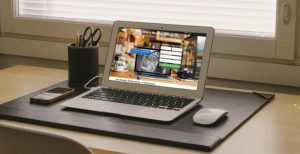 If you have an established brick and mortar business, the tools and training found at Wealthy Affiliate can help you get more business in your door. It may even open up new possibilities for selling your products. Along the way, you will learn to build a website, organize your site, attract visitors and ultimately earn income from your website. 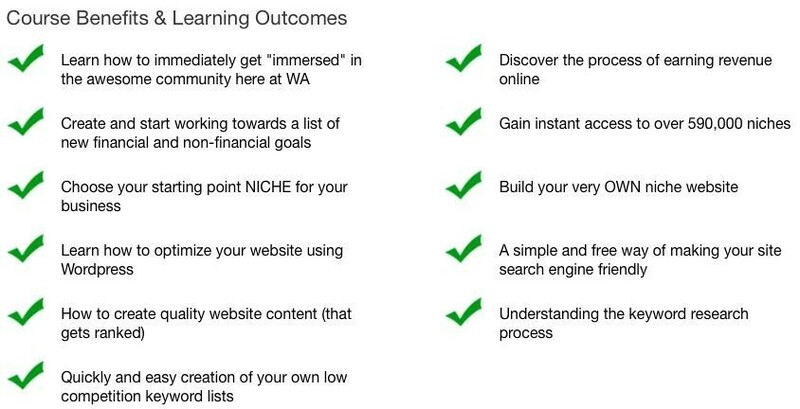 With the Premium membership at Wealthy Affiliate, you have full access to all of the training with WA. In fact, you have full access to all of the features that Wealthy Affiliate offers. The Free Starter Membership allows you to get to know the program and decide if you want full access to all of the features. 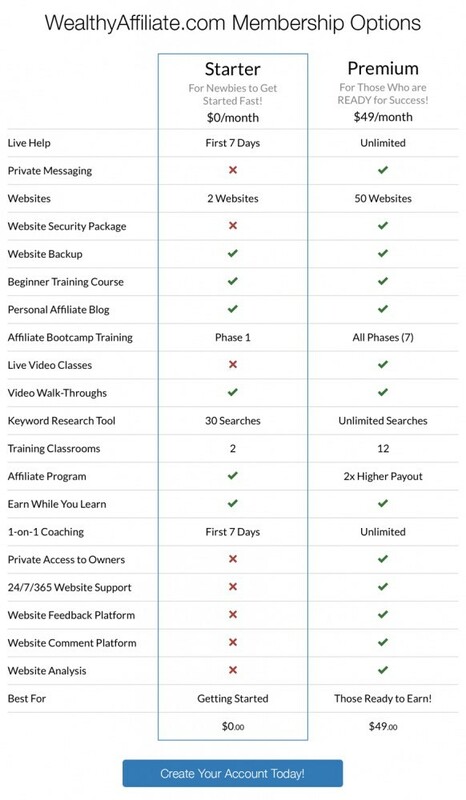 Initially, you will want to take part in the certification training at Wealthy Affiliate. This set of 5 Courses, each containing 10 lessons, will walk you through the basics. You will learn to choose your focus ( WA calls this your niche), build a website around your focus, learn how to reach your readers, and earn income while helping other’s to find what they need. This is a place where you will learn how to build a business of your own and create the life of your dreams. The first level of the Certification Course has 10 modules. You can check these out for free! This is a way that you can kick the tires at WA and see if this is something that works for you. You can get your feet wet with only your time as an investment. The remaining courses in the Certification Course cover more advanced topics and are available to Premium members. To get the full benefit of the Wealthy Affiliate Platform, you will want to join the Premium Level. Ready Check Out the Free Training? The formal training modules are just one part of the training available at Wealthy Affiliate. In addition to these training modules, members have created training to explain things in more detail. Many of these are available to Free members, all are available to Premium members. The Wealthy Affiliate community is one of the best parts of this platform. Members share with other members advice, training, and stories of their successes and some of their problems. When you follow other members, you can view their postings from the notification window. There is always a live chat active with other members that will provide help and counsel if you get stuck with something. Each member has a personal blog page (Here is my WA Blog) where they can share. Each training and post has an ongoing chat for questions and answers. The membership is very active. Since WA has members in 195 countries and with 1.2 Million members, there is always someone available to help you with your site or provide assistance with whatever you need. Currently, we have 3 new mentoring groups. Two are run by successful WA members the third is being run by one of the owners of Wealthy Affiliate. Each has a group of hand-selected members that they will be helping to succeed. You don’t need to be in a mentoring group though. There is always someone that can answer any questions that you have. 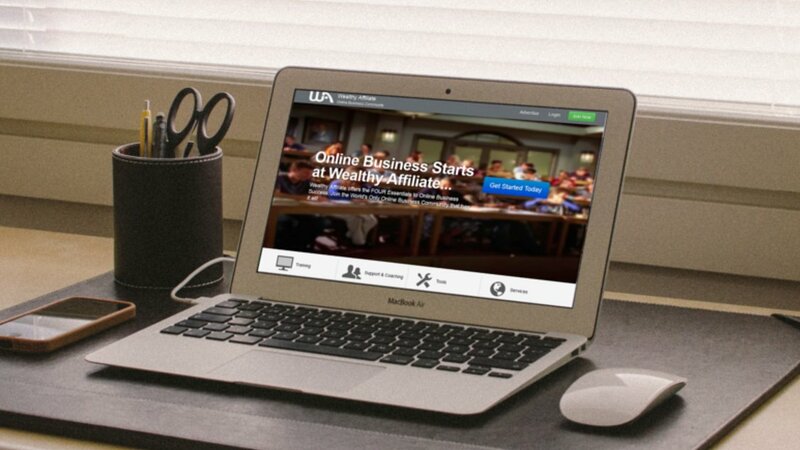 Wealthy Affiliate has tapped into the number one best selling website platform (WordPress) to create and optimize websites. An automated building process takes the installation process to a whole new level. You can have a website up and initialized in under a minute. Passwords are secure and saved where you can reach them to log in at any time. Your website can be viewed on all devices. Not all of your visitors will be on a desktop, your site is always available to phones, tablets, and computers. If you decide to leave Wealthy Affiliate, your website is portable and it belongs to you. Simply transfer it to another hosting service and you are good to go. Website security is becoming more of a problem every day. Even Amazon was taken offline last year. Wealthy Affiliate has state of the art security behind their platform. Hackers are stopped in their tracks before they are able to penetrate your site. A spam blocker is in the background as well. No need to have your site monitored and cleaned, the spam is handled at the server where it will never be a problem on your site. Web robots (bots) are not allowed access and the back office (password) attacks are filtered before they even occur. WA is one of the safest platforms that you can choose. Most hosting provides a security layer called https (Hyper Text Transfer Protocol Secure) for an additional charge. Wealthy Affiliate provides this free with your hosting package. WA is a registrar and sells website URLs just like a plethora of the other hosting companies. However, with the WA Site Domains platform site security, WHOIS privacy protection, Instant set-up, and unlimited emails are all included in the price of a domain. Overall, you will pay significantly less when you purchase a domain through Wealthy Affiliate. The hosting package at Wealthy Affiliate is the most powerful hosting that I have ever used. I have been a customer of Hostgator, GoDaddy and Bluehost over the years. Each of these other packages while they seemed good at the beginning of my time there, had serious problems in the long run. Support was horrible with some, others were just too darn expensive or provided a good price to start then upped the ante when it was time for renewal. Eventually, I abandoned all of the other hosting programs and moved all of my sites to WA hosting. I haven’t had a problem since. The Wealthy Affiliate hosting package is fully managed both with automated checking for security and site speed and is also manually viewed to provide a human backup to the automation. The managed sites include virus and malware protection, a site speed optimization feature and have a top-rated support that usually responds within minutes. I have actually had support tickets that were answered in under 1 minute with a full resolution to my problem within 5 minutes. It doesn’t get any better than that. With my old hosting, first, you contacted them via the chat window. You would typically be walked through all of the basic troubleshooting even if you had told them what you had already done. The support team in the other hosting was clearly reading from a script. Often a follow-up phone call is necessary and even more often the support personnel are non-native English speakers who were difficult to understand on a good day. Included with your membership to Wealthy Affiliate is a keyword tool called Jaaxy. Starter Members have access to a limited version of Jaaxy and every Premium member has full access to the Jaaxy keyword research platform and can track your Siterank for specific keywords. It is a huge benefit to be able to find and target specific keywords that are highly searched by your potential readers and are not highly competitive. This means that you will reach the people that you are trying to reach. You aren’t writing for people that are lost in the weeds but the ones that are searching for your message. Keyword research can be very powerful if done correctly. Using a tool that provides good data is key. Jaaxy is that tool. Included with your membership is a place where you can create your own content in a centralized location. I have multiple sites. In the past, I have been using Google Docs to create my content. The Site Content Platform is a place where I can organize all of these into a coherent place. A distraction-free place to create. A way to add images free of copyright restrictions (over 100,000 images available for free). Posting directly to multiple websites. Grammar and spelling error checking. A way to create personal templates to speed up content creation. Overall, the Site Content Platform at WA helps me to be much more efficient and simplifies the process of content creation. After all, affiliate marketing starts with providing information to your website readers. The Site Content Platform makes this a pleasure. 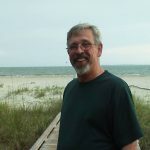 When Craig first talked to me about giving Wealthy Affiliate a go, I was a bit skeptical. I’d been burnt in the past by shoddy groups in the form of eBay training courses, and I have to admit, I was afraid the same thing was going to happen again. Thankfully, I decided to try out the free membership. Fast forward 5 years and I’m quickly approaching full-time income status thanks to the skills and relationships that I’ve gained from Wealthy Affiliate. It’s a wonderful community of like-minded individuals. Day or night, there’s always someone around to bounce ideas off of and gain insights into how other people approach Internet marketing. From complete newcomers to seasoned veterans and everyone in between, the members of WA are more than happy to share their knowledge and opinions when asked. I originally joined for the training, and I’m still there 5 years later for the ongoing support and camaraderie. If you have read to this point you should be congratulated! I’ve tried to give you an overview of what is available inside the Wealthy Affiliate Platform. This is a full-featured training and personal development course with all of the tools that you need to create an online business. You might even have a physical store that can benefit from learning how to promote online. Wealthy Affiliate can definitely help you to create an online presence for your brick and mortar business. The membership at Wealthy Affiliate is a bargain when you look at the resources that are available to you. The cost of just hosting at any one of the major hosting companies will run more than the price of Wealthy Affiliate. If you look at many of the other training courses online, you will find price points that start at $1000 and often will climb to $10,000 or more to be part of their systems. Wealthy Affiliate is a fraction of what these so-called gurus charge. There is no charge for the Starter Membership. You can use it for as long as you wish. The Starter Membership is not a limited time offer. There are two levels of membership inside Wealthy Affiliate. The first level is called the Starter Membership. When you initially sign-up you will be a Starter member. Starter Membership is free. There is no charge to get started, kick the tires and see if you like what you see. Starter members have limited access to the training but the first level is available so that you can get a feel for the training and see if it is for you. Once you have your feet wet and have completed the first course you will want to join the Premium level. The Premium level of Wealthy Affiliate opens up all of the remaining training. This is the only additional level and costs $49/ month. Full access to everything Wealthy Affiliate provides is included. Your only additional charge will be when you want to purchase a URL. These are only $14/ year and you can even purchase these with credits if you have built up a credit balance in WA. If you decide to go to the Premium level within your first 10 days, you can get the first month of Premium for only $19. An annual membership is also available for $359/year, less than a dollar per day. Starter Membership: Free access to the first training course, Starter Classroom and all of the non-premium training created in WA. I hope you will enjoy Wealthy Affiliate. I have created a full-time business from what I have learned here. I’m sure that you can too. Very thorough and well written review about wealthy affiliate. Being a member myself, I will say you won’t find a better place to learn how to build a business online and make money through affiliate marketing. Best of all it’s free to sign up, and trust me you won’t regret it. I am constantly amazed by the improvements that are released each year. The Premium membership when compared to comparable hosting actually saves you money. That is just one aspect of the WA program. The free Starter Membership makes signing up a no-brainer in my opinion. I landed on your website as I was searching for an affiliate program I could join to learn the ropes of Affiliate Marketing. Wealthy Affiliate looks good however, there seems to be a lot of information and tools. I’m new to Affiliate Marketing. If I joined, do you think it will be overwhelming for me as a beginner? I really want something that is not too technical and is easy to follow. It is true that there is a lot of information available at Wealthy Affiliate. Sometimes people do feel overwhelmed with all that is going on. The training is organized into small pieces that are easy to understand. The step-by-step approach gives you the ability to take it in small bites so that you don’t become overwhelmed. Each of the training modules (the lessons) have a specific set of 3 or 4 tasks for you to do. They are completely outlined in the training so all you need to do is follow along with the training and do the tasks as they are presented. Before you know it, you will have everything you need to build a lasting income online. The tools that WA makes available to you takes all the technical stuff that makes it difficult to succeed and breaks things down into easy steps. I won’t say that you don’t need to know all of the technical stuff but the training makes learning about it easy. Of course, I’ll always be around to help you too. I’ve been teaching this stuff for years. So, I can help you to get over your stumbling blocks. Excellent review of Wealthy Affiliate. The step by step training has helped me tremendously. We started way back in 2011 and had no idea how to even build a website. They teach you exactly what you need to know to start an online home business. It seems every year they just keep adding more value into the program just like you mentioned. It doesn’t matter what you want to promote. You get to choose your own niche or you can have multiply niches. It’s like having a one stop shop. I like how you explained all the tools that are included with your membership. Like you said you can even go and kick the tires and see if you like it for free. Who does that? They have the largest community in the world. That should let you know that they are the real deal. Two thumbs up on your review. Great job. This last year saw the release of the Site Content platform, free HTTPS security for all sites hosted on WA servers and multiple changes to the site layout and updates to much of the training. WA is focused on providing the best experience it can to the members here. Changes out on the web are echoed inside WA as quickly as they can be identified. Add to that the active community of members and the amazing amount of help available and WA quickly becomes the best platform to learn. Great website and review Craig. I landed on your site after reading your blog on WA. I am a new member, still learning the ropes and I have bookmarked your site for future reference. It’s very inspirational to see the progress of so many established members. I’ve been a member of WA for 8 years. While the training is top notch, I find that the tools, the hosting, website creation and content sections of the site are the real jewel that Wealthy Affiliate provides. I’m glad I was able to provide you with a dose of daily inspiration.